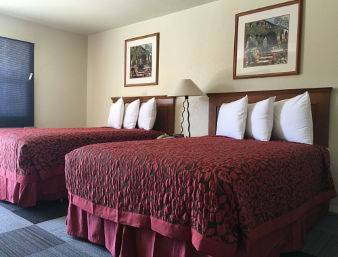 Enjoy budget accommodations and friendly service at Knights Inn Gallup East hotel. This lodging facility is well situated for those seeking a comfortable place to rest while exploring the Petrified Forest National Park, Chaco Culture National Historical Park, the El Morro National Monument or the Navajo at Canyon de Chelly National Monument. There are several restaurants nearby and the University of New Mexico Gallup is just two miles from this property. Newly renovated guestrooms include a flat-screen HDTV with cable offerings, complimentary wireless internet access, and table and chairs, while family suites are ideal for extended stays, with full kitchens, and separate living areas. Complimentary large vehicle parking, and a complimentary continental breakfast are also offered at this lodging facility.